Can the idea of increasing the drop rate of Arcane Dust be entertained? I would venture to say that bracers are one of the more popular crafted items. With the 120 Arcane Dust cost, I am finding it to be my crafting choke point currently. Especially since it's used for just about everything else as well. I'm not necessarily complaining about the cost, I just think the combined drop rates of Arcane Dust and blues are a little too low in comparison. Instead of grinding for leg mats I now find myself grinding for blues. I honestly get more excited when a blue drops than a yellow. Allow Arcane Dust to have the chance to drop in stacks of 5 or 10 or whatever. Increase the amount you get from salvaging a blue item. Allow me to salvage items purchased from venders (not ideal, but I'd take it at this point). 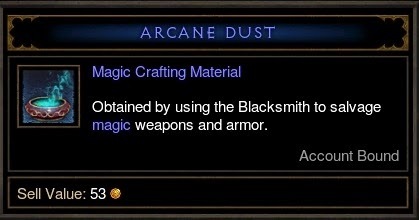 Allow me to trade in other crafting mats (crystals) for Arcane Dust.